This is a recipe that my father loves, he loves anything with vinegar in it. Sean on the other hand does not like vinegar, he calls it kryptonite. I like this recipe alone or with some broiled fish. This is What's Cookin on Beaty's Creek today. Blanch green beans in boiling water for 4 minutes and then place in ice water. Drain and place in large bowl. 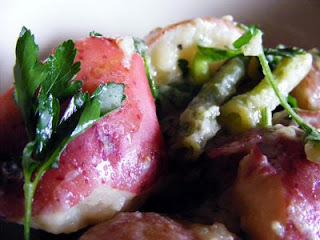 Boil potatoes for 12 minutes or until fork tender, drain water and place into bowl with green beans. Mix in a small bowl, Paul Newman's Light Honey Mustard Salad Dressing, oil and Dijon, once mixed pour over potatoes and green beans and add parsley with salt and pepper to taste. Serve warm or cold. To me it tastes better the next day.